Located in the Adriatic Sea, to the east of Italy, lies the island of Corfu, also known as Kerkyra. Its Mediterranean and British influences are evident in the island’s architecture, historical landmarks and cuisine. Home to many cruise ships and golden beaches, the island welcomes tourists all year round. Some famous attractions include Old Perithia and Achilleion Palace. 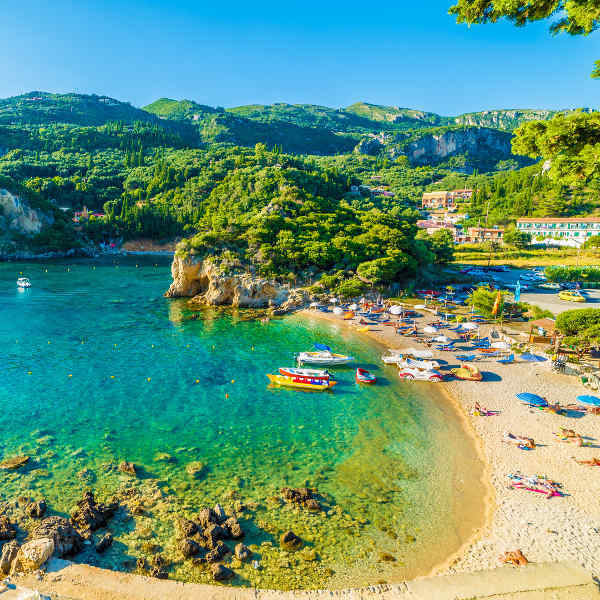 Cheap flights to Corfu are now available for a limited time only, so book your flight today and prepare to be swept up by the charming character and picturesque scenery of this vibrant Greek island! Corfu is home to Corfu International Airport (CFU), a 10-minute drive from the city centre. With over 12 beaches sprawling the coastline or tucked away in little coves, you’ll have plenty of space to spread out and bask in the glorious Mediterranean sun, watching the crystal, clear waters lapping against the shore. Stroll through the cobbled streets of Old Perithia, Corfu’s oldest and best-preserved village, comprised of historical buildings. The Roman fishing villages of Kassiopi and Benitses are charming with their characteristic taverns and picturesque scenery. Learn the age-old traditions of olive-pressing; the Museum of Asian Art is a rarity, housing precious artefacts from around Asia. 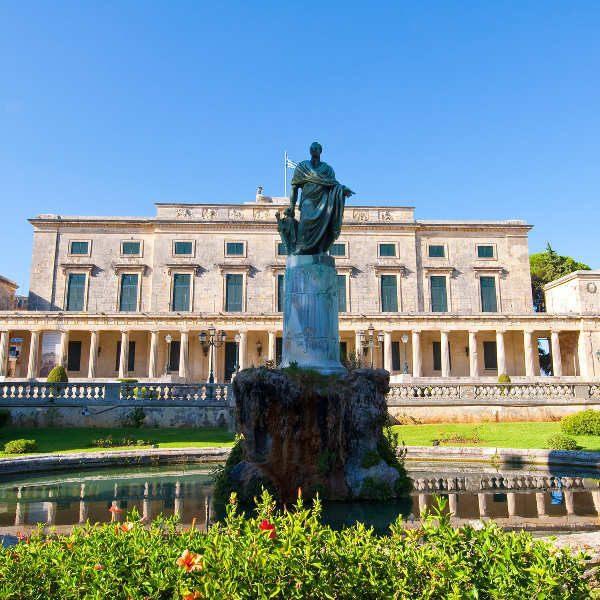 Jump back into royal history at the Achilleion Museum and Gardens. If you adore sunshine, the peak summer in July and August is best suited for you, when balmy beach days and hot summer nights are no longer just a fantasy. Bear in mind that this is the busiest time of year and you’ll be fighting the crowds for a spot on the beach or a table at the local café. The sweet spots in June and September are ideal to maximise on fewer visitors while the warm, Adriatic Sea is at your disposal. There is the possibility of rain in September, so bring a rain jacket just in case. Don’t think that winters in Corfu are cold and boring. Although the air does turn a bit chilly and the sea may not be ideal for swimming in, on the upside you’ll have the beaches all to yourself and the quiet villages are perfect for some lazy strolling around and getting to know the locals. 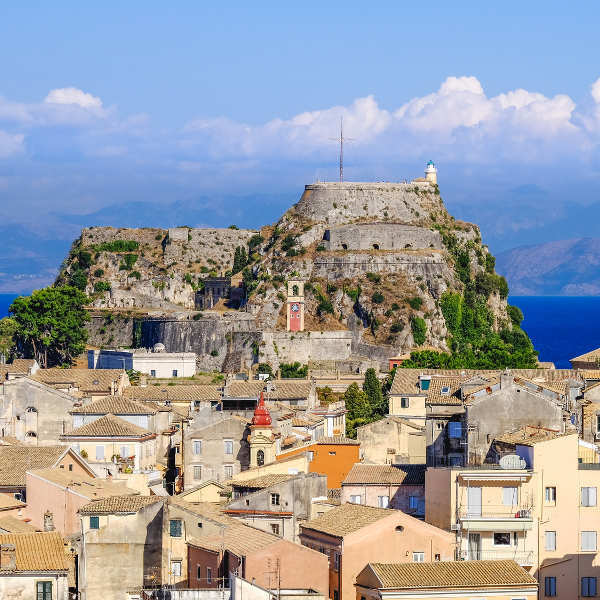 Dotted with charming weather-beaten villas and Byzantine churches typical of Greece, Corfu is by far the greenest and most touristic Ionian island. The northern half of the island is dominated by mountains, while the coastlines to the west and east are steep and dramatic. Spend your days wandering the age-old passageways of Kassiopi or explore the central boulevard of Corfu. The island is brimming with ancient attractions, beaches and fabulous walking trails. The oldest village in Corfu, Old Perithia, is a Heritage Protected Site located 408m above sea level. It used to serve as a hideaway for pirates and there are 8 churches and over 100 houses in the area. You’ll also find The Esplanade, Old Fortress and 19th century Regency Palace there. Nymphes is a large village in Corfu where, according to legend, nymphs used to use the village’s waterfalls to bathe in; you can sample local sweets and alcohol to take home. History-lovers must check out the traditional village of Kynopiastes, sprawling with mansions and churches. If the water sports, nature trails, museums and feasting on local delicacies don’t keep you busy enough, there are at least 12 different beaches where you can soak up the Greek sunshine. Compare several airlines, and book your cheap flights to Corfu online at Travelstart. Corfu is one of the safest holiday destinations in Europe. Nonetheless, visitors should exercise the usual precautions and be vigilant with valuables and personal belongings. It is advisable to carry money in a money purse/ belt, rather than in your back pocket, particularly around shopping areas. The summer months bring searing heat, so pack in lots of sunblock and a hat. Insect repellent is also a good idea for pesky mosquitoes and wasps. While you’re frolicking in the warm ocean waters, watch out for jellyfish. The water in the town is not preferable to drink – stick to bottled water which is widely available.